A Rolls Choice Livery has a rich history, much like our fleet of unique vintage cars. The Rolls Choice journey began in 1983, when we were married. 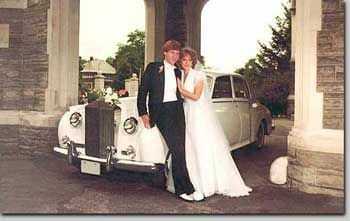 We liked the Rolls Royce we used for our wedding so much that we bought the car and established our business soon after in 1985. Over the years we have acquired the largest vintage Rolls Royce fleet in Toronto and the GTA. We have taken years and put care in selecting our fleet of vintage cars and enjoy bringing the same feeling of joy we had on our wedding day to other couples on their special day. All our Rolls Royce motorcars are rare and have unique histories, just like every couple. We are more than happy to help you determine the best vehicle for your unique story. Renting vintage cars for weddings and other occasions is something we, and our chauffeurs, take the utmost pride in. Much of our business comes from referrals and Wedding Planners in Toronto and the GTA. Let us help you turn your wedding or special occasion into a lasting memory you won't soon forget!